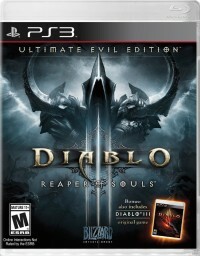 Diablo III is once again raining death and destruction across consoles, with the release of the Ultimate Evil Edition. The official Diablo III game guide has been updated with new details about the special features and control specifics of this console release. Many Blizzard Blues posts today focused on the UEE, detailing some last-minute changes to transmogrification, and current issues with the new Diablo III console game. 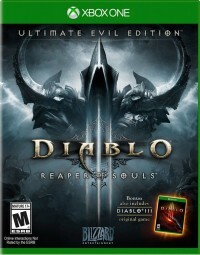 The official battle.net Diablo III game guide has basic info on all versions of the game. It was updated for the Ultimate Evil Edition, providing specifics about new features like Nemesis Monsters, Apprentice Mode, and Action Combat. We're always searching for ways to expand and improve the guide with answers to all of your questions. If there are any aspects of the game you're curious about, let us know in the comments! Here are a few common questions that players have had as they jump into the Ultimate Evil Edition, answered by Araxom. Why can't I connect online to Ultimate Evil Edition games through the PS4? We are currently investigating this issue and are collecting information from affected players in this thread. Why can't I connect to the Diablo III server on Xbox Live? [UPDATE] 9/3 – The corrective patch for Ultimate Evil Edition on the Xbox One (26590) is now live. This patch should resolve any difficulties Xbox One users were experiencing when multiple consoles were attempting to connect to online UEE games through the same router. If anyone continues to experience further Xbox One connection issues, please refer to the following Xbox One network support page or contact Microsoft directly for specific console assistance. [UPDATE] 8/21 - We believe we've identified the cause of the issue affecting Xbox One users (as noted below), and the resolution will require a forthcoming patch that we are currently working on. We don’t expect it to be too long before this corrective patch goes live, however we do not have an exact ETA to share as of this update. We will be sure to provide more information here as soon as we can. Thank you for your continued patience, we appreciate it! "The Diablo III server is not available at this time. Please try again later." To be clear, many Xbox players are able to connect online to Ultimate Evil Edition at this time. A common factor linking affected players is having two Xbox One system connecting through the same router. This scenario doesn't comprise all the reports we've received, however, only the majority of them. Although we do not have a resolution to offer at this time, we are continuing to investigate and will be sure to update this thread as soon as more information becomes available. Thanks to everyone who is affected for your continued patience! What happened to my Infernal Pauldrons? We've received a few reports from PS4 players noting that they have been unable to claim their Infernal Pauldrons. Additionally, please ensure that your console is connected to the internet, as downloading the available patch over PSN is required to collect the item. I linked my XBL and SEN accounts, so where is my Signet Ring of the Blizzard? After you've successfully linked your Sony Entertainment Network and Xbox Live accounts via Battle.net, launch Ultimate Evil Edition and create a new game. Once you're in game, visit your newest town hub and open your Shared Stash. Under the "Ring" category, you should see your Signet Ring of the Blizzard. If you do not see the ring, try relogging into the game after waiting a few minutes. For more information on account linking, click here. Issue's still being addressed - thanks for your continued patience! To address these issues I deleted the DLC item, and had to choose the alternate DLC download from the sony playstation online store. There was no way to locate the alternate versions in the PSN store on the console. from what I could tell. I had to be using the download queue on the web store under my PSN account. Once I had the correct DLC pack downloaded it installed automagically and my pre-prder items appeared once i started the game. Thanks for the heads up! I'm passing that along. Sorry to harp on dear Blizzard folk. But is there an eta on the patch to fix the server connect issue? The corrective patch that was referred to in the 8/21 update has not gone live yet, but as soon as it has I will be sure to update the original post. Dropping in for another brief update - the corrective patch for Xbox has not yet been issued, but I will continue to pop in with updates until this issue is resolved. Although I don't expect it to be too much longer before the patch is released, I am still unable to offer an ETA. Thanks again to all the affected users for your continued patience. Are players in Latin America that downloaded the game from the PS Store ever going to be able to play in english? I already bought the game and it's only in spanish even when my console is set to english. Many friends haven't bought the game only because of the language. Greetings and thanks for your answear! In your region, the Ultimate Evil Edition is currently available only in Spanish and Portuguese. Although I am not aware of any plans to offer the game there in any other languages, I will pass your feedback along. Thanks! EDIT: fixed the problem. I had to restart the console to trigger the update. Read on for more Ultimate Evil Edition issues and topics, including a bug that can prevent Belial from being killed. There are specific oddities and bugs in the Ultimate Evil Edition version of the game, that are being reviewed by the Blizzard QA team. Here's the current list of big issues, including a problematic bug with Belial. Hello everyone, and welcome to Diablo III: Ultimate Evil Edition on console! Below you will find are some of the most visible and commonly-reported Known Issues for Diablo III on Consoles. We ask that you please do not report any bugs that you see on this list, as we already know about them. We would also appreciate you advising other players to consult this list before reporting an issue. As a reminder, this list will not list every bug that is active on every platform. What it is listed here are a select few issues -- chosen due to visibility and impact -- that are active and confirmed as bugs by Quality Assurance with verifiable steps and (in most cases) an expected fix. Just because a bug is not on this list does not mean we don't know about it! In addition, potential exploits and the like will never be listed here. Thank you for your continued reports, and enjoy Diablo III: Ultimate Evil Edition!!! Daily bonus bounties are not currently cycling between acts properly, and are always targeting acts I and II. Using a vortex-like ability such as Cyclone Strike or Black Hole can break the Belial encounter and cause the boss to become stuck in an invulnerable state. In the earlier blue posts, it was stated that players who imported characters from the base console edition of Diablo III would gain the transmogrifications from Legendary items that they already had. That was changed near the end of the development process for the Ultimate Evil Edition. As with the PC version of the game, all transmogrification designs in UEE will only be obtained from finding new items. I have new information to share regarding this subject. Shortly before shipping UEE we made a design change that resulted in Legacy items found in Diablo III to no longer automatically unlock as Transmogrify options when imported over. As a result, only Legendary items found in UEE will unlock as appearance options for transmog, and those found previously will not. The transfer process for characters coming from the old console version of Diablo III involves a few steps. Lylirra outlined them once again, to help players who are moving from the base console edition to the Ultimate Evil Edition. 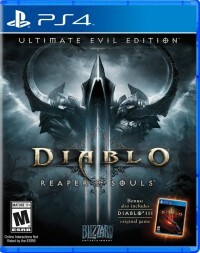 In order to complete a saved data transfer to next-gen, you'll need three things: a save, a Diablo III disc (or access to a digital version of the game), and a current-gen system. The reason the disc and system are important is that you'll need these to both download patch 1.0.3 for Diablo III (this patch enables the cross-brand/cross-generation transfers) and then export your save to our servers. 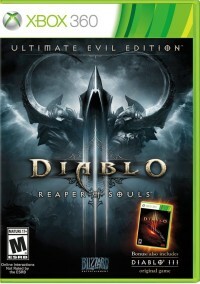 If you don't have your Diablo III disc and/or your Xbox 360, though, you're not out of luck. All you need to do is borrow a disc (from a friend, family member, rent it from a store, etc), ditto for the 360, and then complete the steps provided below. If you have a friend that has a digital version of the game installed on a 360, that will work too!